Hawaii's Jared Alexander threw a shutout yesterday for his third win of the season. 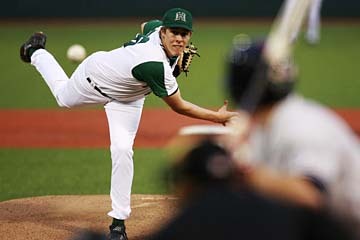 A solid performance by starter Jared Alexander and clutch hitting from Sean Montplaisir and Jon Hee helped Hawaii knock off Fresno State 4-0 in the Western Athletic Conference opener for both teams last night at Les Murakami Stadium. Alexander tossed a four-hit shutout and set a career high with 10 strikeouts to improve to 3-2. Montplaisir singled and tripled and scored two runs, and Hee went 2-for-4 with an RBI double and a run. Brandon Haislet and Alex Myers each reached base in three out of four plate appearances as Hawaii snapped a four-game losing streak. Tanner Scheppers, the reigning WAC pitcher of the week, entered the game with a 1.04 ERA for the Bulldogs, but allowed three runs on five hits in six innings to take the loss. Hawaii players congratulated Brandon Haislet at the plate after he scored the first run in the the Rainbows' victory over Fresno State at Les Murakami Stadium. Jared Alexander continued his brilliance at Les Murakami Stadium with his best start of the season. Alexander got Steve Detwiler to ground out with two runners on to cap a four-hit shutout as the Rainbows won their Western Athletic Conference opener 4-0 over Fresno State last night in front of a crowd of 1,094. The crafty right-hander improved to 3-0 in four home starts and has allowed only two earned runs in 30 2/3 innings. He struck out a career-high 10 and only walked two to earn his first shutout as a Rainbow. "The crowd is awesome," Alexander said. "I feed off of it. Opening up the WAC season with Fresno at home. It was awesome." The Bulldogs didn't get more than one runner on base in an inning until Danny Muno's first hit of the game put two on with two outs in the eighth. Alexander quickly ended the threat by striking out pinch hitter Jordan Ribera on three pitches. "He pitched great tonight," Hawaii coach Mike Trapasso said. "Our guys were definitely more into it tonight. We showed some pride in UH baseball." Alexander also got into a little trouble in the ninth, as an error by second baseman Jon Hee and a single by Alan Ahmady put two on with one out, which brought a visit to the mound by Trapasso. "I mostly went out there to have the fans yell at me to keep him in," Trapasso said. Alexander had thrown 115 pitches at that point and was a little nervous Trapasso was about to take him out. "I was worried," Alexander said. "He just asked me who I was going to get the double-play ball to." One of Hawaii's problems this season has been its inability to hit with two outs and runners in scoring position. Designated hitter Jeff Van Doornum struck out with two on in the first, but Sean Montplaisir came through in the second with an RBI triple to center. Montplaisir's line drive over the head of center fielder Muno scored Brandon Haislet, who led off the inning with a single. Hee followed with a bloop single to center to drive in Montplaisir to give Hawaii a 2-0 lead. "We focused on being more aggressive and worked on changing out contact points," Trapasso said. "(Montplaisir) has been swinging well of late. He's a good player." Montplaisir's second run of the game put the Rainbows up 3-0 in the fifth. He led off with a single and moved to second on a catcher's interference call that put Hee at first. 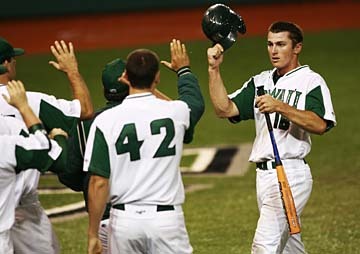 A walk to Alex Myers loaded the bases, but all Hawaii could manage was a run on a fielder's choice by Vinnie Catricala. Haislet took Scheppers' 100th pitch of the game to center for a triple to lead off the bottom of the sixth, but the hard-throwing right-hander came back to strike out the side and leave Haislet on third. Scheppers tied his career high with 11 strikeouts, but only lasted six innings after throwing 120 pitches. He allowed three runs on five hits and walked one. Hee greeted Bulldogs reliever Jake Floethe with a double to the wall in left-center to open the seventh. He came around to score two batters later on a single by Myers for the final run of the game. The teams return to action tonight for the second meeting of the four-game set at 6:35 p.m. Nick Rhodes (0-2, 8.15 ERA) will take the mound for the Rainbows opposite Fresno State starter Justin Wilson (2-2, 4.64 ERA). E--Wetzel, Grubb, Hee. DP--Fresno 1. LOB--Fresno 7; Hawaii 9. 2B--Susdorf, Hee. 3B--Haislet, Montplaiser. SB--Haislet. HBP--by Scheppers (Myers); by Hower (Young). BK-- Floethe. Umpires--Billy Haze (Plate); Joe Burleson (First); Billy Speck(Third).